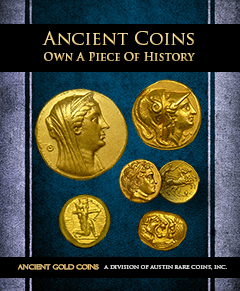 In our Ancient Coins - Own a Piece of History guide, you will find some of our most interesting and beautiful ancient coins dating back thousands of years. A carefully chosen selection of certified ancient coins can prove to perform well over time as astute investors and collectors have discovered the importance of adding ancient coins to their portfolios. It is also important to note that all of our Ancient Coins have been graded by NGC (Numismatic Guaranty Corp), the top grading authority in the marketplace.